The attached petition has been drafted to insist that the U.S. Government take immediate action for the recovery of the remains of 13 WWII American Airmen. Men who gave their lives in defense of our country, still entombed in a watery grave for the past 70 years. We are soliciting the support of all patriotic Americans in this effort to bring home our men that have been left behind. Background: Our Government, along with vital information from Italian sources, has located two B-24 Liberator heavy bombers downed by German defenses in 1944. Both planes were part of the 15th Air Force 449th Bomb Group stationed in Grottaglie, Italy. Credible evidence indicates that there are the remains of 7 MIA Airmen from the Kendall crew site (MACR 2711) and 6 crew members from the Hanson crew site (MACR 12511) waiting to be recovered & returned home to grieving relatives. The Joint POW/MIA Accounting Command (JPAC) is tasked with recovery efforts of our fallen heroes in foreign lands and to ensure that no man is left behind. Our government was originally informed of the Kendal crash site in 2007. Three years passed before a site investigation was initiated by JPAC in 2010 to confirm the original information from Italian authorities. Nothing has transpired since the 2010 site investigation. In September 2013, the Hanson crash site was brought to light by Italian media after rogue divers had vandalized the site. A second site investigation/survey has purportedly been scheduled for May of this year for both the Kendall and Hanson crash sites. The attached petition has been started by the families of the MIA’s requesting necessary funding and immediate action for the recovery of the remains of the 13 Airmen. The petition was started out of frustration from the apparent lack of urgency in the recovery process. The 449th Bomb Group Association fully endorses this petition. Time is of the essence. Documented incidents of looting threaten to desecrate the resting place of our fallen heroes with each passing day. Both sites are under water creating a deteriorating recovery condition. Further delays will only lead to unnecessary escalation of recovery costs and threaten the viability of a successful recovery. While contacting family members for DNA comparison with the 13 MIA crew members, several siblings in their late 80’s and early 90’s responded by saying that they had been waiting for this call for 70 years. Closures for the wives, children, grandchildren, brothers, sisters, nephews, & nieces have long been overdue! We as a Nation owe it to these brave men to bring them home; men that knew there was little chance of survival and signed up anyway. It is time for We the people, American patriots, to speak up for these warriors of the Greatest Generation and memorialize what they have sacrificed for our freedom. We must be advocates for all WWII Veterans; Army, Air Force, Navy, Marines, and Coast Guard. For if not us, then who will carry on the memory of what these men have sacrificed for the freedom that we enjoy today? Thank you for your support of this petition. By signing you have helped right a terrible wrong. • Harvey Gann was taken Prisoner of War. After three failed escapes, a fourth attempt allowed him to reach the Russians. Author of book Escape I Must: World War II Prisoner of War in Germany. St. Lawrence Cemetery, New Haven, Connecticut. The Brenner Pass and the rail line and roadway through it is one of the most important transportation routes connecting Northern and Southern Europe. Brenner Pass was the lowest of the mountain passes through the Alps and lay along the Austrian/Italian boarder in the region of Bolzona. The associated rail line linked Innsbruck, Austria to the North to Verona, Italy and points south. It served as a primary supply route for General Albert Kesselring’s Army Group C forces opposing the Allies in the Italian Campaign. The Pass and the Brenner Line were frequent targets of the tactical air forces of the 12th Air Force with the interdiction of Kesselring’s supplies as a primary mission. Medium bombers and fighter-bombers of the 12th attacked bridges, trains and convoys along the route. The heavy bombers of the 15th Air Force were also called upon to supplement the tactical forces in interdicting this important supply route. The 449th Bomb Group had attacked the Brenner Route as early as 29 March 1945, hitting the marshalling yard at Bolzano, a choke point south of the Pass. Two missions were flown against Brenner Pass in October. Multiple missions were flown in November and December targeting various bridges, marshalling yards and other choke points along the route. The Germans built up defenses around the Pass and the obvious choke points along the route. The 449th hit Brenner Pass on three consecutive days in late December losing a crew on each day. The mission plan for 28 February 1945 called for the entire 15th Air Force to strike bridges and marshalling yards along the Brenner Route. “It is reported German troops are being moved out of Italy over the Brenner Route to reinforce the Russian southern front so a successful attack on today’s targets will delay this withdrawal and cause a piling up of traffic which will present excellent future targets.” The line had been cut from 3 February through 25 February, but repairs had allowed traffic to begin moving again on the route. All four groups of the 47th Wing were tasked with the destruction of the railroad bridge over the Isarco River at Albes, south of Brenner Pass. Each group was to provide two formations of aircraft with the formations 12 minutes apart to allow smoke from the preceding attacks to dissipate. 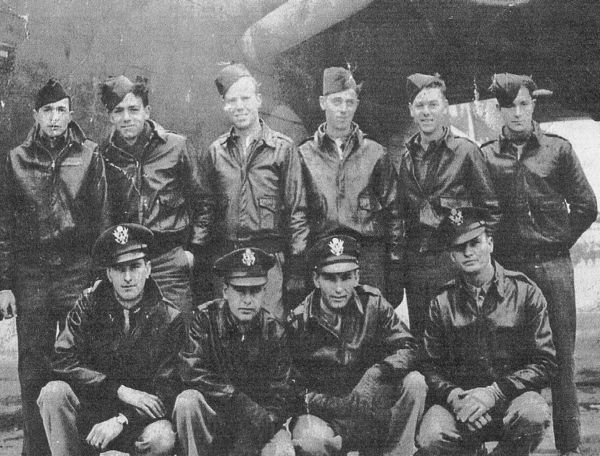 The 449th was to lead the Wing with the 450th, 376th and 98th Bomb Groups following. It was estimated that enemy defenses would be encountered about 8 miles prior to reaching the target. Prior missions had classified the defenses as Moderate intensity, Accurate, Heavy caliber flak. Takeoffs began at 0846 to make a 1245 target time. The 716th and 717th Squadrons comprised the 449th’s lead “Red Force”, with the 718th and 719th Squadrons following as “Blue Force”. Each squadron flew 8 aircraft with the exception of the 718th which put up 9 planes. Group Operations Officer Jonathan Knox lead the entire 47th Wing flying with the Hochendel crew. Howard Hanson and crew were on Knox’s wing as deputy lead. On the run from the Initial Point to the target the formation began to encounter flak that was judged as moderate in intensity but highly accurate. The flak bursts bracketed the lead 716th Squadron with such accuracy that all eight ships received damage. Both pilot Hochendel and navigator Zielienski in the lead ship were wounded. The Hochendel/Knox crew landed at Bari to get aid for the wounded. The deputy lead ship flown by Hanson left the target with two engines out. The Morrison crew also lost two engines and also had a wounded bombardier. They would land at Zara in Yugoslavia at a friendly field. Three other aircraft in the squadron received major damage but were able to return to Grottaglie. The 717th Squadron faired only slightly better as two ships received major damage with 5 others slightly damaged. The George Blair crew was flying a ship named “Wild Honey” on its first mission with the 449th (see Book IV, page 212). “Wild Honey” was a B-24H s/n 42-52682 that had been transferred from the 8th AF, 486th BG, 832nd BS. The ship took a flak hit to the wing which left a man-sized hole through it, damaged the left main landing gear and resulted in over 300 holes in the fuselage. Both Blair and co-pilot John Halverson would receive Distinguished Flying Crosses for bringing the badly damaged ship back to Grottaglie and a safe landing. “Wild Honey” was salvaged after its only 449th mission. The 718th Squadron leading “Blue Force” had three ships with major damage. The Hagen crew flying Ship #31 lost the #3 engine and had a hole through the #4 propeller. It crash landed back at Grottaglie, but was repaired and finished out the war. The Lawrence crew had two engines feathered after the target, but were able to make it to a safe landing at Zara. The 719th Squadron at the rear of the formation escaped significant damage. Overall bomb damage by the Group was good. The lead squadron dropped early due to extensive damage to the lead and deputy lead ships. The 717th Squadron had several bursts plotted on the rail line just north of the bridge. The 718th Squadron in “Blue Force” scored multiple hits in the immediate vicinity of the aiming point with at least one direct hit. The 719th Squadrons bomb falls went into the smoke from the 718th hits. The 450th Bomb Group followed the 449th into the target and was also met by accurate flak and lost one ship to this target. The 98th and 376th followed without loss. All three of these groups also reported good bomb coverage on the target with a few direct hits. The mission against the Isarco rail road bridge was a costly one for the 449th. One ship lost with an eleven man crew, three ships landed at friendly fields with 3 wounded crewmen, twenty-three ships damaged – 10 severely, and one ship salvaged. 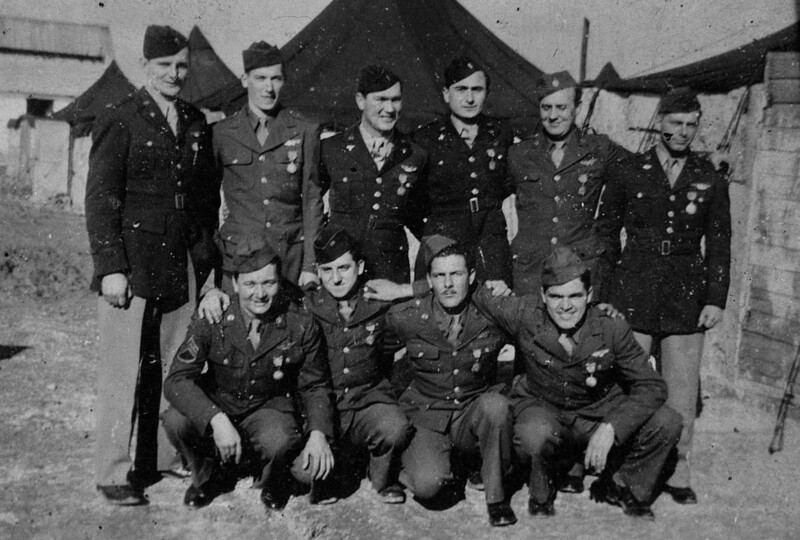 Seven Distinguished Flying Crosses were awarded to crewmen for the mission. As noted above, the Hanson crew in 42-51642 left the target with two engines out. They began to lag behind the formation and were last seen in the vicinity of Lake Weissen Austria. The fate of this crew remained unknown until August 2013 when the remains of 42-51642 were positively identified in the Adriatic Sea near Grado, Italy. Aircraft 42-51642 was a radar equipped “Mickey Ship” with a radome replacing the ball turret. Flying a deputy lead, the radio operator would have been dedicated to the radio console rather than manning a gun position as normal. Thus Lawrence Nally would have been at the radio console and ball turret gunner Adolph Turpin took his place at the right waist position. Antonio D. Fermano was the normal navigator of the Hanson crew but was replaced by Clarence L. Dragoo of the McGrath crew for the mission as a lead navigator. Richard Horowitz flew aboard lead ships as needed to operate the Mickey radar set. The body of Adolph Turpin, waist gunner, 35898272, was found on the beach near Grado on 24 May 1945. He was buried in a local cemetery and reburied in the US Military Cemetery at Mirandola on 26 July 1945. The body of Darrell E. German washed ashore at Chioggia on 3 July 1945. He was interred in a local cemetery and reburied at Bari on 7 September 1945. The body of James S. Cox floated ashore near Comacchio on 26 July 1945 and was buried in a local cemetery. He was reinterred at Mirandola on 28 February, 1946. The body of Edward H. Betz washed ashore in the vicinity of Cavanella D’Adige south of Venice in July 1945. He was buried in the US Military Cemetery at Mirandola on 9 August 1945. The body of Albert Acampora was hauled aboard a fishing boat in its nets off Chioggia on 1 December 1950. The remains were buried in the Pellestrina cemetery near Venice without Allied authorities being notified. In 1957, the German War Graves Commission was moving German war dead from the Pellestrina cemetery to the new German military cemetery Costermano Lake Garda. During this process, they came across the remains of Acampora which were identified by dog tag. His remains were returned to the US and buried in New Haven, Connecticut in July 1957. The wreck of the Hanson aircraft, 42-51642, lies in about 40 feet of water 8 nautical miles from Grado and 8.5 nm from Lignano Sabbiadoro in the northern Adriatic Sea. This wreck had long been known to local divers and fishermen, but no one knew the identity of the aircraft. Today there is little left of the wreck, only the central structure of the fuselage, the wings and four engines. Armament, propellers, instruments and everything that was easy to remove has been removed cut or broken off the wreck. While the wreck had been frequented by divers for years, only in the last few years had a few researchers begun to try to identify the aircraft, reconstruct its history and tell the story of its crew. None of the data plates containing engine serial numbers remain, the radio call sign placard is missing from the instrument panel and the machine guns with their serial numbers are gone. Thus the actual identity of the wreck was elusive. Retired archaeologist and aviation researcher Freddy Furlan had become interested in this wreck in the early as 2000’s. Early on the wreck was assumed to be 42-94741 of the 484th Bomb Group named Vivacious Lady. Freddy was not convinced that this identification was correct and began a laborious project to positively identify the wreck. An examination of photos of the wreck revealed that the #3 engine had been feathered prior to ditching, the landing gear was retracted, and the flaps had been lowered a few degrees. At impact, the tail of the aircraft had been torn away and the nose turret had broken away from impact with the sea floor and was apparently buried in the sand. From official documents, none of the B-24s known to have ditched in that area of the Adriatic had the number three engine out which seemingly put the research at a dead end. In the Fall of 2009, Furlan learned that a Browning M2 machine gun had been recovered in the nets of a fishing boat near Lignano. The gun carried the serial number 1033487 which was traced back to Missing Aircrew Report 12511 and aircraft 42-51642. The last reported position of Hanson and 41-51642 was over southern Austria so how a machine gun from aboard it was found in the Adriatic remained a mystery. Freddy Furlan obtained the Individual Deceased Personnel File (IDPF) for Howard Hanson to try to unravel the mystery. From the IDPF he learned that the body of Adolph Turpin had been recovered near Grado, and the bodies of Betz, German and Cox had been recovered south of Venice. The IDPF speculated that the aircraft had crashed in the Gulf of Venice. Based on prevailing currents in the Adriatic, Furlan speculated that the aircraft had actually crashed near Grado where Turpin and the Browning gun had been discovered and the prevailing currents had carried the bodies of the other three southwest past Venice. Information from the Missing Aircraft Report confirmed that 42-51642 was last sighted with the #3 engine feathered and the #4 engine smoking. A data plate found on an engine oil tank carried a contract number which was awarded to the Willow Run plant producing Ford built B-24s. This did not eliminate Vivacious Lady as the wreck as both it and the Hanson aircraft were built at Willow Run. A glass tube was found that was later identified as part of the E.C.M. or radar countermeasures equipment which would have been installed aboard lead aircraft. This and the above evidence implied that the wreck was probably the Hanson aircraft. However, nothing definitive had been found to prove the identity of the aircraft. In the Summer of 2013, Freddy presented his research regarding this wreck to the local marine protection group which included his opinion that it was most probably 42-51642. Inspired by his research the Civil Protection of Grado organized a dive on the wreck to attempt to positively identify it. From this effort, the vertical stabilizer showing the aircraft serial number was discovered buried in the sand a short distance from the fuselage. After 69 years, the fate of the Hanson crew was finally known. This document was compiled from official documents including Mission Reports, MACR 12511 and the IDPFs of the Hanson crew. It also relies heavily on the research and writing of Freddy Furlan of Villa Vicentina, Italy. As of September 2015, the USNS Grasp is station keeping over the wreck of 42-51642 assisting a DPAA crew in a recovery mission to return the remains of the MIAs still aboard and around the aircraft. PURPOSE: To strongly request the U.S. Government to provide funding and take IMMEDIATE action to recover the remains of 13 World War II MIA Airmen from two known B-24 Crash Sites; further, that the Italian Government immediately be requested to secure both crash sites to eliminate further destruction and looting. AUTHOR: James J Fox, Nephew of T/Sgt Thomas McGraw, Nose Gunner, Hanson Crew. We, the undersigned, promote this petition, exposing the lack of urgent priority by the US Government and Italian authorities to secure and recover the remains of thirteen WWII MIA airmen located in the Grado area of northern Italy. Secondly, we petition for sufficient funding required to complete the full recovery of both crash sites in an expeditious manner. Due to recent documented incidents of looting and decimation of the two crash sites known by both countries, it is imperative that action, crash site security and funding be addressed immediately by the US Government and Italian authorities. We will not distribute your name, email, or other information to third parties, other than intended petition recipients (i.e. Congressmen, government officials).